I watched “Detective Conan: Private Eye in the Distant Sea” today, 20 Apr, 2013. I watched Detective Conan: Private Eye in the Distant Sea, referred on the fake news article of Kitsune Shimbun(きつね新聞), my Japanese blog for fake news. Mossad doesn’t appear like my fake news article. As the spy case about Japanese Maritime Self-Defense Force‘s Aegis ship, although there appear JMSDF Criminal Investigation Command(海上自衛隊警務隊) and an officer for protecting the secrets, Koan(公安), the security police arm of Japanese police forces didn’t appear except one scene that Police Inspector Ohtaki(大滝警部) or so of Osaka Prefectural Police(大阪府警察) refers their public safety division(公安課) that they handed the spies over to. The secrets of Aegis ships are a big matter. Kogorou Mouri(毛利小五郎) persuade them to cooperate by saying that. But JMSDF should’ve asked Koan foremost. Athough it would be very good for China, for North Korea, and for Russia to come to mind foremost, the movie doesn’t point those countries for it’s children’s anime movie. But it’s probably very good to show the deep story showing the war that we really face at present. * Koan(公安) referred as the security police arm isn’t Public Safety Commissions(公安委員会). The latter is the police committees of the state and of the 47 prefectures. So it’s wrong to refer “Public Safety Commission” as the Japanese secret police. 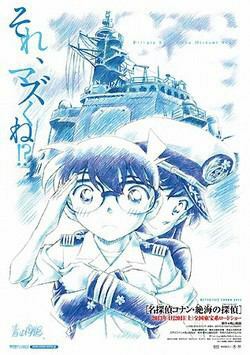 Posted on April 21, 2013 June 20, 2017 Categories UncategorizedTags anime, mangaLeave a comment on I watched “Detective Conan: Private Eye in the Distant Sea” today, 20 Apr, 2013. I tried settling a new Japanese blog: Kitsune Shimbun for deceiving with false article on 1 Apr., 2013. I tried making a new Japanese blog: Kitsune Shimbun(きつね新聞). Its theme is to post the jokes thoroughly deceiving people. From the start, I don’t keep its parent blogs both in English and in Japanese well. So I don’t know how long and how well I will keep this blog. Kitsune is a Japanese word for “fox”, an animal. In Japanese folktales, foxes enchant people by turning their features into mankinds and various things. The 1st article on the blog is a copy of my April Fool Joke in 2000. (I save that text on another web page. And you can read also its English version.) When I saw that Natalie Portman says that she wonders if her face is ugly in an article of a movie magazine, I associated her comment with Maya Kitajima(北島マヤ), the heroine of Mask of Glass(ガラスの仮面). So the idea of that article flashed through my mind. And the 2nd article is the 1st original arctivle for the blog with lying about Detective Conan: Private Eye in the Distant Sea. I haven’t made its English article. Posted on April 6, 2013 Categories Uncategorized, Update DiaryLeave a comment on I tried settling a new Japanese blog: Kitsune Shimbun for deceiving with false article on 1 Apr., 2013.